In Italy, textile finds are roughly evenly divided between balanced tabby weaves (with about the same number of warp threads and weft threads in a square centimetre), weft-faced tabbies (where the warp threads are thin and loosely packed and thicker, densely packed weft threads hide them), and various kinds of twills. The woollen twills usually have 10-30 threads per centimetre. This technology should be very familiar to anyone who has studied ‘barbarian’ or Viking Age European textiles, when wool twills with herringbone, diamond, and other pattens in the weave were popular. It also has very strong affinities with Iron Age finds from sites in the Alps such as Halstatt. In the Aegean, Anatolia, the Fertile Crescent and the Zagros Mountains, textiles are divided into balanced tabby weaves and weft-faced woollen tabbies. These usually have 50-100 weft threads per centimeter. No twills have been found in hundreds of samples from Greece. Weft-faced tabbies are suitable for making multicoloured tapestries such as kilim. Early Greek woollens were completely different from Northern European textiles, and very similar to textiles from the Near East. There are some hints that these two traditions met in Illyria, and this eastern technology became dominant in the imperium romanum, perhaps because of the massive importation of slaves from the eastern Mediterranean in the last century of the Roman Republic. Evidence for dyes is limited but murex purple, red madder, blue woad, and various yellow dyestuffs have all been identified in textiles from Italy. It is good to know that plant dyes were often combined in a sequence of baths, so a dying process which began with woad might end with a colour anywhere from black to pale green. 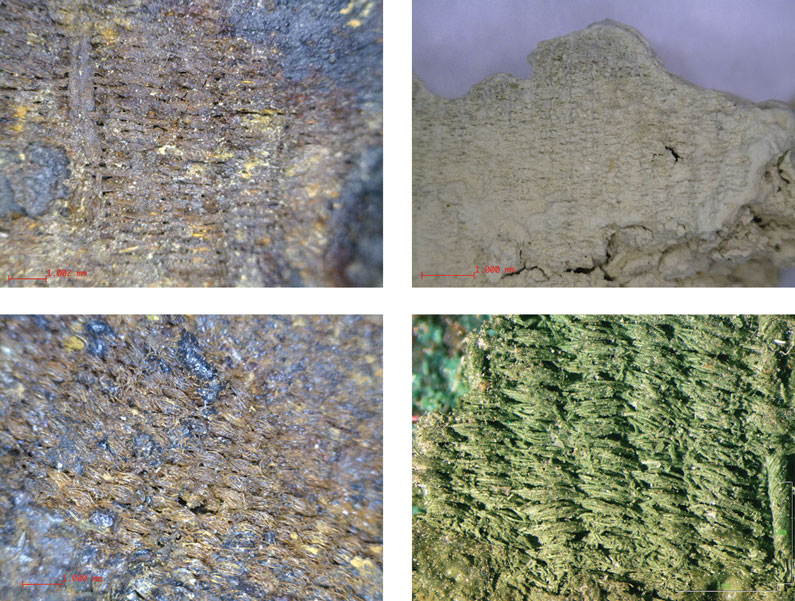 In addition, some plant dyes are easier to detect in degraded or long-soaked textiles than others: shellfish purples seem easier to identify than lichen purples. She also has an acadaemia.edu page. This coming week is a big one: NASA will try to land the InSight rover on Mars (Monday 26 November, 3 pm EST), Canada Post has a strike in the middle of a referendum with postal ballots, and an eccentric Canadian will be defending his doctoral dissertation (Monday 26 November, 3 pm Austrian time). See you on the other side! Hey Sean. Did you happen to discuss 3-D weaving- weaving multiple layers together directly without sewing or gluing them together? Hi Paul, great to hear from you! We did not talk about things like that, before our talk I did not understand what people meant by “weft-faced tabby weave.” She knows Hero Granger-Taylor and gave me some people to talk to about leather in early Greece. She agrees that there should be bronze fittings from tube-and-yoke armour with traces of the linen or leather preserved in the corrosion products. I am glad that you still have time for your Greek research, I hear that Christian Cameron’s group is experimenting with the renaissance rotella techniques and Greek shields. I’m doing a workshop on hoplite spear use with Christian next year. My understanding of hoplite spear has been heavily influence by partisan and rotella, as well as Philippine spear and taming shield, and of course ancient text and imagery. I am part of a huge group of hoplite reenactors getting together in a few years. We have many tests planned on the use of panoply, the movement of men in groups, othismos force production, and group combat. I cite Fred Ray’s letter about statistics and spears in vase painting in my dissertation. For your new post on linen armour, I think that AB&A found all the references to linen and leather armour in Greek and Latin literature, but overlooked some of the inscriptions and papyri which are harder to search. I included one in Armour in Texts. There is also the reference to stolidia “little garments” in Aeneas Tacticus which might be a copyist’s error for spoladia “little spolades.” This came up on RomanArmyTalk all those years ago, but it seems to have dropped out of the debate since. Todd Feinman has built a twinned linen tube-and-yoke and a leather scaly one, and Matthew Amt gave one of the Indian firms some swords out of Killian-Dirlmeier to copy, but I have lost track of what the other hoplite reenactors and reconstructors are doing. I think they moved to FB or something? I heard something about another planned event at Marathon but I could never track it down and get in touch with anyone. Where will your workshop be held? I’m waiting eagerly for Your message, how battle was fought and won (I hope). Mr. Bardunias thanks a lot for Your article, there are some new and useful informations even for me. I’m belonging to Krentz, Van Wees camp of hoplites, but I’m interested in Your latest book and practical research. Despite the fact, I’m not fan of Cameron books, attitude to Alexander, Diadochs, antiquity in general. I think in his books there is lot of modern thinking, signs of oicophobia, than ancient ideas, reconstruction of minds belonging to Ancient Greek warriors. Yet I’m curios, what practical experiments of his group brings. The probe landed and I got a Sehr Gut on the defence of my thesis. I do not know exactly what Christian Cameron’s group in Toronto are working on, because they have reduced their web presence over the last decade and keep it close to their chest. He taught a workshop on the renaissance partisan-and-rotella material which one of the organizers has described. Ten years ago there were people systematically examining all published vase paintings from a period of 30 years or so and cataloguing every example of specific types of clothing and equipment, fighting techniques, and so on but I have heard nothing since. Congratulations to Your new title Sean, I hope You had some afterparty, or there is celebration in order. You are welcome Pavel! I had the requisite glass of bubbly, silly T-shirt and dinner at a restaurant.